The future of sports in Nigeria, especially with regard to ambush marketing, is in putting in place a special legislation to check the activities of smart ambush marketers. Our intellectual property laws are deficient in this area. If you are still in doubt, then show me the section of our intellectual property laws that you can invoke against Usain Bolt who kissed his Puma shoe during an event sponsored by Nike? Ambush marketing is a phrase coined to amplify a brand that connects itself to a particular event, without paying any sponsorship fees to be an official sponsor. This was best demonstrated in the case of Usain Bolt at the 2016 Olympic in Rio Brazil, where he kissed his Puma shoe after winning the 100 metres dash. Nike, the sportswear giant, was the official Olympics sponsor and a rival to Puma in the sportswear business. That was a clear case of ambush marketing. And it is the creativity and innovation being employed by the proponents of ambush marketing that has made our intellectual property laws in different countries helpless in matters relating to ambush marketing. The existence and manifestation of this phenomenon at global sporting events have become so emboldened and deeply rooted that legal experts are working round the clock to curtail its menace by devising other ways outside the known traditional intellectual property laws. But in Nigeria it is a strange practice and malady that is still unknown, despite the fact that we have hosted global sporting events like the Junior World Cup and African Cup of Nations before now. It may interest us to note that one of the conditions of FIFA for awarding countries the right to host the World Cup deals with how ambush marketing can be tackled through the instrumentality of the law outside the known traditional intellectual property laws that have become deficient in this sphere. The existing traditional intellectual property laws of most countries, including the ones of Nigeria, tackle issues relating to the unauthorised use of a registered trade mark, logo or slogan, use of a copy of any artistic work protected by copyright or a deliberate misleading of the public. The cases of ambush marketing that has dominated sporting events in the last few years have thrown up a big challenge, thereby making mockery of the existing traditional intellectual property laws in place globally. Although frantic efforts have been made to curtail ambush marketing at the global level through existing traditional intellectual property laws, the limited number of case law on the subject, outside this jurisdiction, has proven that the existing institutional and legal frameworks are inadequate in the task of curtailing the practice. The traditional intellectual property and unfair trade laws cannot guarantee any protection because of the creativity of ambush marketers, who know the wordings of the laws well enough not to breach them. Not even the intellectual property law plus that was initiated as a complimentary effort has been able to address this lacuna. The few cases against ambush marketing that were successful, even though their claims were founded on traditional intellectual property laws, were those brought under laws on the appropriation of trademarks or breach of copyright. A good example of this is the case of Arsenal Football Club and Matthew Reed. In this case, Arsenal Football Club filed an action against Reed for selling club merchandise without a license from the club. The merchandise had the club logo, which was trademark protected, on it. Reed’s argument that he used the logo as a mere badge of allegiance was rejected by the Court. The ambush marketing cases that event owners and official sponsors find most challenging are those related to intrusion and association, given the fact that these practices fall outside the ambit of traditional intellectual property laws. The New Zealand “Ring Ring” case is a typical example of how imaginative ambush marketers can be in order to avoid breaching the laws; though upon close examination, “Ring Ring” was found to be a clear reference to the Olympic rings symbol. Pepsi’s use of NBL teams’ home towns, instead of the teams’ names was done to avoid the breaching of trademarked names. The two instances cited above (the Ring Ring case and Pepsi) show that traditional intellectual property laws are like a toothless bulldog in any fight against ambush marketing. There is need for far-reaching legislation that would be a more effective weapon for tackling all aspects of ambush marketing. The reason(s) for ambush marketing is (are) not farfetched. 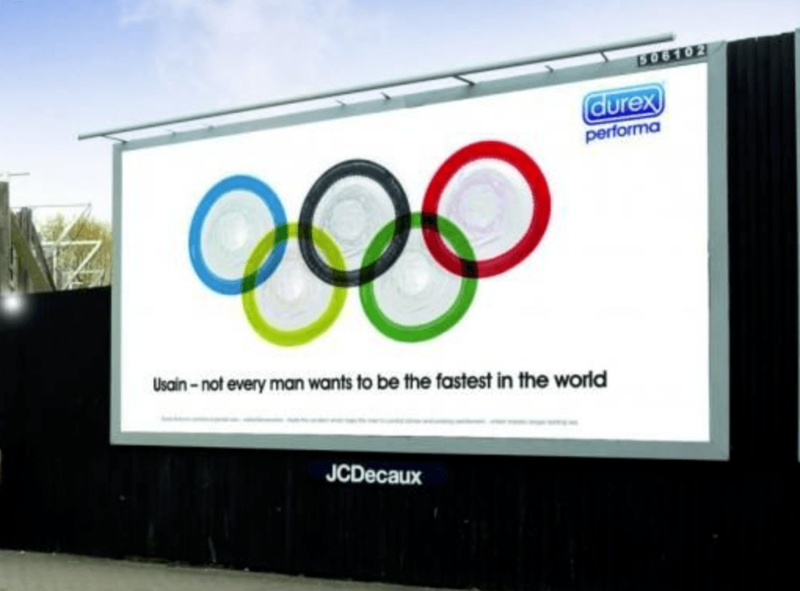 Global sport events like the Olympics and the World Cup have become battle grounds on which marketers try every trick in their kitty, in their bid to convince consumers of the desirability, if not usefulness, of the products or brands they promote. And the reason why marketers pull out all the stunts at these events is plain enough: they constitute the two largest global sporting events with mammoth broadcast reach, thus providing marketers the most advantageous occasion for advertising their products to consumers. The 2008 Beijing Olympics was a good example of the audience reach of the Olympic Games. It is on record that the games were beamed to a live audience of over 4.7 billion or 70 per cent of the World population. In Africa, South Africa is already ahead of Nigeria in this sphere. The laws put together for the South Africa World Cup 2010 were so all-embracing that ambushers found it very hard to explore loopholes. The South Africa World Cup 2010 model of the fight against ambush marketing has become a ray of hope to future sponsors and event owners. The tussle by different brands to outdo themselves at major sporting events like the Olympics or World Cup is linked to the commercialisation of these events, with particular regard to corporate sponsorship. Sport sponsorship is an attractive area for both companies and event organisers from the perspective that they provide the most coveted room for selling their brands to a wide audience. There is also the additional benefit of a boost to the image of a company for identifying with the event and the real sports heroes. The sole aim of sports event organisers is to maximise income, and corporate sponsorship is a very effective means of achieving this goal. Sponsorship takes different shapes and shades. It can be in the form of official sponsorship of the main event, or of athletes, or even a team. In most cases, companies that lose their bids to secure the status of official sponsor of the main event tend to opt for identification with particular teams or athletes for the chance to showcase their brands to spectators. It is this interplay of differing forms of sponsorship that gave birth to the phrase, ‘ambush marketing’. While event owners and official sponsors see ambush marketing as detrimental to sporting events, those who engage in it see their action as squarely within the ambit of the relevant laws. But no doubt, if the activities of these ambush marketers are left unchecked, they could lead to dire consequence such that sponsorship of major events like the Olympics and the World Cup would be difficult to secure. From the above analysis, can we comfortably say that the Nigeria intellectual property laws can curb this menace? Before we proceed, we must note that the Nigeria legal system evolved from the United Kingdom, and by extension our intellectual property laws are almost the same as those of the United Kingdom. And the lacuna in both countries’ laws are to a reasonable extent cemented by the international treaties that they are signatory to. While the Copyrights, Patents and Design Act, 1988 is the regulatory legal framework for intellectual property matters in the United Kingdom, the Nigerian Copyrights Act, 2004 is the one in Nigeria. A cursory look at the two laws show that the one of the United Kingdom Act has gone through a serious legislative furnace than the other in matters relating to the handling of intellectual property matters. Inspite of the legislative height already attained in handling matters relating to intellectual property by the United Kingdom, during the London 2012 Olympic, a sui generis legislation was put in place specifically to curb ambush marketing. And this helped in no small measure in reducing the parasitic activities of ambush marketers. In Africa, South Africa is already ahead of Nigeria in this sphere. The laws put together for the South Africa World Cup 2010 were so all-embracing that ambushers found it very hard to explore loopholes. The South Africa World Cup 2010 model of the fight against ambush marketing has become a ray of hope to future sponsors and event owners. Sport analysts are agreed that South Africa is the first country, arguably, to take the boldest step in this direction. The South Africa experience in the fight against ambush marketing shows how effective legal instruments can be when appropriate and all-embracing laws are in place and there is a willingness to enforce them. The future of sports in Nigeria, especially with regard to ambush marketing, is in putting in place a special legislation to check the activities of smart ambush marketers. Our intellectual property laws are deficient in this area. If you are still in doubt, then show me the section of our intellectual property laws that you can invoke against Usain Bolt who kissed his Puma shoe during an event sponsored by Nike? A sui generis legislation in place against ambush marketing will go a long way to encourage sports sponsors and marketers. We must act now. The future should be today. The world is leaving us behind. Our brother, South Africa has set the ball rolling since 2010. Rockson Igelige, an entertainment law lawyer, writes fron Oleh, Delta State.